Telegraph Avenue [DNF Review] – my books. my life. After 130 pages, I’ve decided to put down Telegraph Avenue. I tried to keep going because, while I never feel that I owe a positive review in exchange for a review copy, I do think I owe it to the publisher and author to read the book. But it became clear that this book was not for me. It took me two weeks to read as far as I did. I was not connecting with the characters, I wasn’t into the story, and I found myself re-reading a lot of sentences. So I am going to leave you with the publisher’s summary and some positive reviews. Just because it wasn’t the book for me, doesn’t mean it won’t be the book for you. I’m starting to think I’ll only make it through if I do the audio. I’m waiting to hear from Bob how it is. This is the second DNF I’ve seen of this book. I will say that Chabon’s other writing has taken me a bit to get through. His writing just feels so high-handed. It drives me crazy. I did finish Kavalier & Clay and really loved parts of it, but at the same time, there were sections that felt completely unnecessary. Is any of this why you didn’t finish, out of curiosity? Yes. I struggled through Kavaler & Clay as well. I liked it, but it took me AGES to read it. 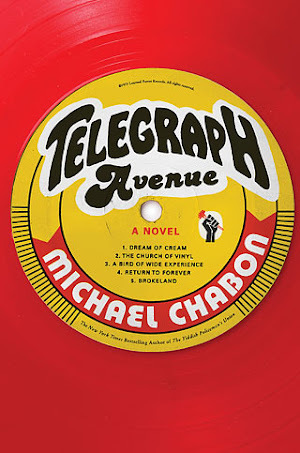 Perhaps Michael Chabon isn’t the author for me. I’m about an hour and a half into the audiobook. I love Clarke Peter’s narration so far, but the story and characters aren’t clicking. I know there is a baby, and used record store, but that’s about it. Hopefully, things will begin to come together today. It’s about 18 hours long, so I’d really like to be engaged with it. In the literary world, this guy is a Rock God, and EW sure liked it. But with 18 discs, it damned well better deliver. That is a long time to listen to something you don’t like. And it is probably the only way I would read it. I have heard so many negative things about this book that I just want to stay far, far away. I didn’t really enjoy his first book, and I am not going to be reading this one either. I’m sorry you were so disappointed with it. I have the ARC of this on my Kindle, and I don’t know if I’ll read it either. I’ll try at least. I listened to The Yiddish Policemen’s Union. While I enjoyed it on audio, I don’t think I would have liked it as much in print. His writing is a bit bloated for me. Michelle! So impressed by this amazing blog and your 2012 Reading List! We are truly fortunate to have you with us.